This step by step woodworking project is about wooden vegetable trellis plans. I have designed this super basic vegetable trellis so you can build it from common lumber using basic tools. You can alter my plans and adjust the size of the garden trellis, so it suits your needs. Make sure you invest in weather resistant lumber (cedar, redwood). See my other DIY projects HERE. First of all, you need to build the legs for the vegetable trellis. Cut the legs from 2×4 lumber. Use a miter saw to make the angle cuts and a circular saw to make the notches in the back legs. Mark the cut lines, make parallel cuts and then remove the excess with a chisel. Smooth the excess with sandpaper. Assemble the sides for the trellis by attaching the base brace. Drill pocket holes along both sides of the braces and then lock it to the legs with 2 1/2″ screws. Lock the legs together at the top with pocket holes, as well. Add glue to the joints and align the edges flush. After assembling the A-frames you need to lock the trellis together tightly with 2×4 supports. Make sure the corners are square and align the edges flush. Drill pilot holes and insert 2 1/2″ screws to lock the supports to the back legs. 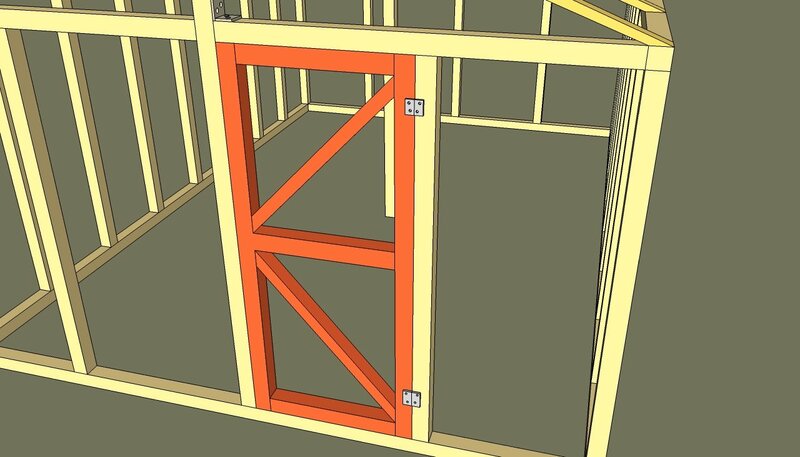 Fit the 1×2 cleats to the interior of the frame, as shown in the diagram. Align the edges, drill pilot holes and insert 1 5/8″ screws to lock everything tightly. Fit the slats to the trellis, as shown in the diagram. Place a 1 1/2″ piece of wood between the slats so you can create even gaps. Fill the holes with wood putty and then smooth the surface with 120 grit sandpaper. You could also apply a few coats of paint over the components to protect them from decay. Make sure the product is safe and will not poison the plants. Check out the rest of my trellis plans HERE. I have plenty of designs to choose from so I really suggest you to take a look. If you like my project, don’t forget to SHARE it on Facebook and Pinterest. Thank you for reading our project about wooden garden trellis plans and I recommend you to check out the rest of the projects. Don’t forget to LIKE and SHARE our projects with your friends, by using the social media widgets. SUBSCRIBE to be the first that gets our latest projects.